I’ve been on quite the ice cream kick lately…well, for the last 27 years. Before completely dropping dairy last year I was having ice cream at least once a week. Hello Dairy Queen twist cone with sprinkles (<- the best). Now that it’s officially summer and I’m off dairy but still craving the sweet, creamy stuff, I just have to make it myself! And when it turns out this good, I’m totally OK with that. 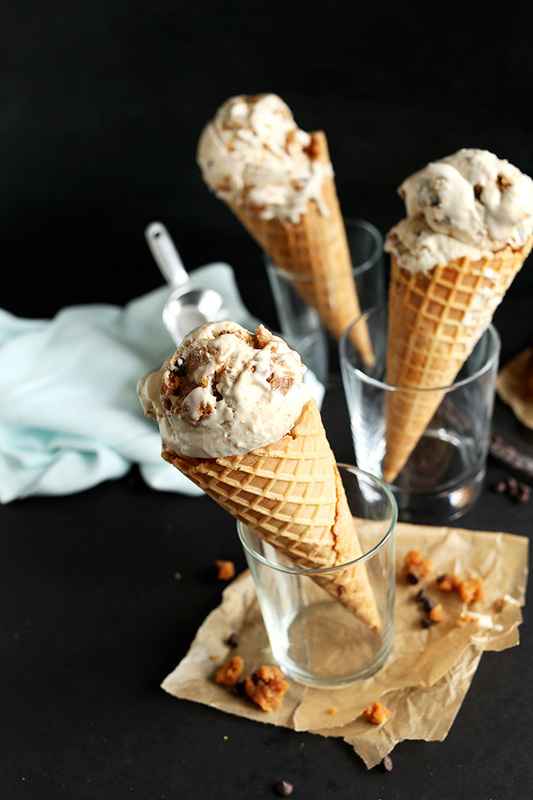 This ice cream is so simple, requiring no fancy methods and just 10 ingredients! Likely items you already have on hand too, especially if you’re vegan or dairy free. If you were to tour my pantry at any given time, you’d likely find multiple cans of coconut milk, lots of raw cashews, and an eggplant or two. You never know when you need to whip up a dairy-free pasta or dessert. In addition to requiring simple ingredients, it’s also fast to make! Once blended, simply chill your batter for 1 hour in the freezer and then add to an ice cream maker. While it’s churning, whip up your cookie dough. In the last few minutes, throw in the dough! It’s super easy and SO worth your time. 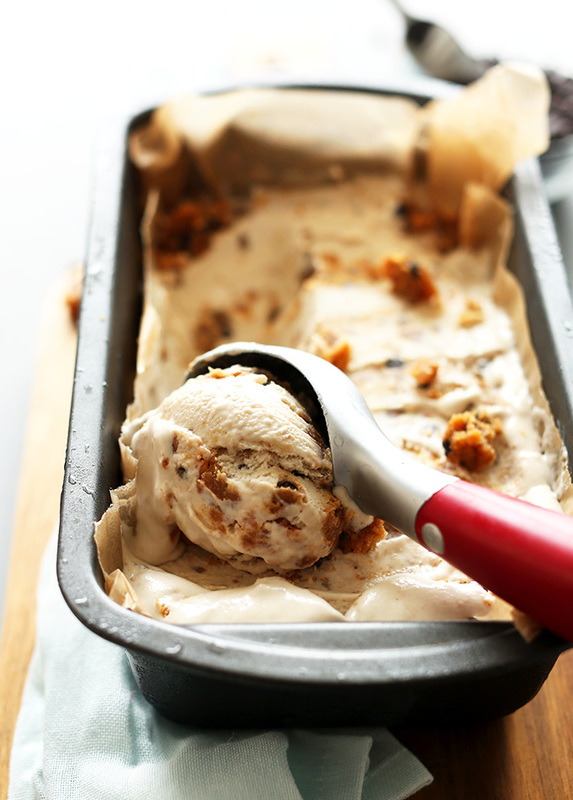 If you’re a fan of peanut butter cookie dough, and you’re the type that will never turn down ice cream, this is the recipe for you. It’s begging to be made and kept in your freezer this summer. Even if you’re not dairy-free, if you have vegan or dairy-free friends they would love you for making this for them. It’s like a hug in a cone. Trust me. I ate one and it totally felt like a hug (maybe better). I don’t have to sell you on this anymore. MAKE this ice cream! And if you do, please take a picture and tag it #minimalistbaker on Instagram or Twitter. It kinda (always) makes my day when you guys make our recipes. Cheers! 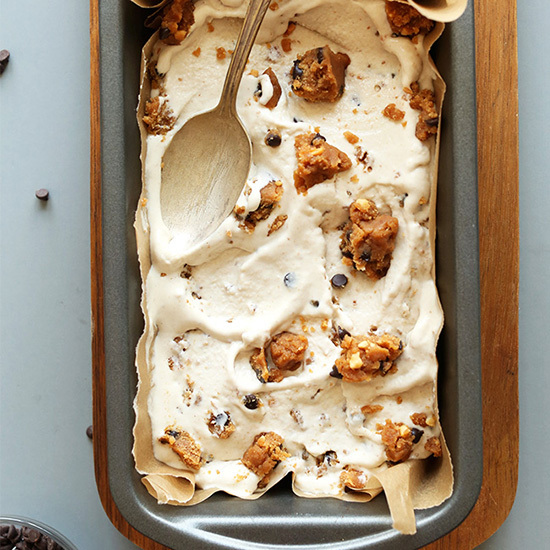 10-ingredient MEGA creamy vegan ice cream loaded with peanut butter chocolate chip cookie dough! So creamy and decadent you'd never believe it was dairy- and egg-free. Add all ice cream ingredients to blender and blend until creamy and smooth, scraping down sides as needed. Use the “liquify” or "puree" setting if you have it. You want it to be completely creamy and blended. Add chilled mixture to ice cream maker and churn according to manufacturer’s instructions - about 45 minutes. It should look like soft serve. If for some reason it doesn't thicken enough, put the mixture (still in the ice cream churning bowl) and pop it back in the freezer to thicken before churning once more. *Recipe (as originally written) yields about 4 1/2 - 5 cups. *Prep time does not include additional freezing time - only hands-on prep. Hi! I made this tonight, I have a kitchen aid stand mixer ice cream maker attachment and the ice cream base froze as soon as I added it to the bowl, which froze the wand that churns it, so ultimately I couldn’t churn it! What kind of ice cream maker do you use? I feel I must have done something wrong, this was my first time making non-dairy ice cream. Hi Kelly! We use this one. Sorry to hear that the recipe has proven to be a bit tricky..
All roads lead to the Minimalist Baker!! Absolutely love the recipes and always find what I am looking for here! Ohhhh myyy!!!! I am definitely making this for my birthday!! And Today! And tomorrow?! haha thanks for the amaze recipe, just wondering if there is a big difference in taste/consistency using coconut oil instead of vegan butter for the cookie dough? Cannot wait to try! There are so many ice cream recipes I’d like to make, but I don’t have an ice cream maker. I already have a bazillion kitchen gadgets, though and very little kitchen (or other) storage in my apartment! Do you have any recommendations on ice cream makers, keeping that in mind? Thanks in advance! We totally get you, Anna! 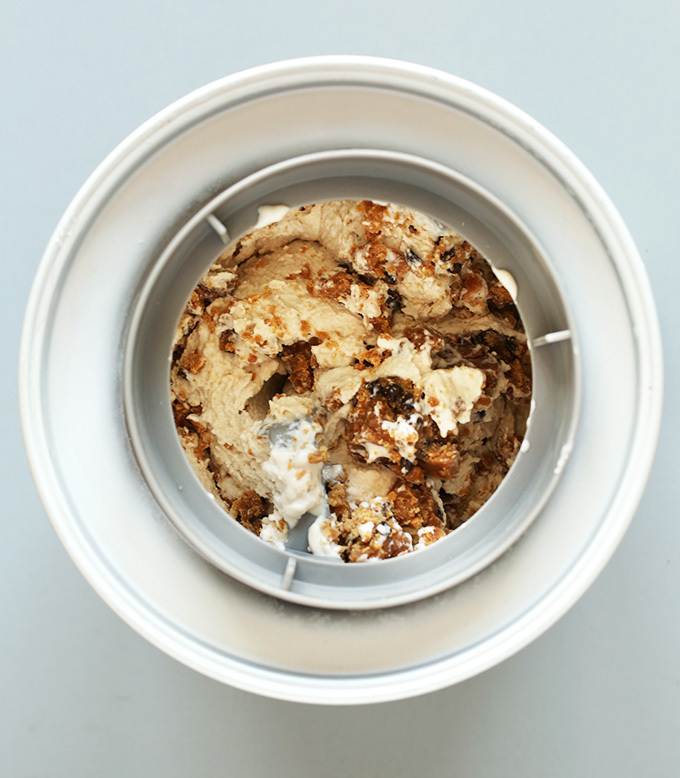 If you do decide to purchase an ice cream machine, we love and recommend this one! This is a question relating to the peanut butter fudge swirl ice cream from the cookbook – like a few other folks, I also ran into trouble with the texture of the finished product. I used Trader Joe’s full-fat coconut milk, homemade natural peanut butter (just peanuts, salt, and a touch of coconut oil), weighed the cashews, chilled the base overnight in the fridge… and it came out super thick and grainy. Most ice creams, including non-dairy, tend to take about half an hour to churn in my ice cream maker, but this one stopped moving after only 10 minutes because it was so thick. Any suggestions (more liquid? long soaking the cashews instead of quick?) would be gratefully accepted – it was delicious but the texture was really off-putting. can we sub the sugar for maple syrup or agave? We haven’t tried using maple syrup or agave for the cookie dough and can’t say for sure, but coconut sugar may be a better sub if you have it on hand! Could I substitute coconut sugar in the ice cream and cookie dough recipe? Hi Lucie! I think coconut sugar would be fine! Full fat coconut milk only the fat from above or the whole can? Hi! It really does not have much of a coconut flavor, but if you are not keen on the flavor, you can use almond milk but I would, in that case, add an extra thickener, such as arrowroot starch to prevent ice crystals. Hope that helps! Good luck! What kind of ice cream maker do you use? I’m looking to buy one, and it seems like you really enjoy yours! This keeps coming out grainy for me. Could it be that I’m using TJ’s coconut milk? I tasted the base before I churned and it was amazing then got a weird texture after. Hi Dana- I have been trying out some of your once cream recipies, this one and the peanut butter fudge ice cream from your cookbook in particular, and each time the ice cream has come out thick more like a frozen custard than an ice cream? Do you know what could be causing that? Could it be the cashew base? I’d appreciate any advice you can give. Hi Paige! The peanut butter may have had something to do with that. I would probably add more liquid next time. Hope that helps! Sorry if I didn’t understand properly: did you add flour to the ice cream and then you eat it raw ? I mean, you don’t bake anything for the recipe? I am going to try and combine layers of this and brownie as a cake. Hi Ran! I would recommend using the Simple Vegan Brownies as your base as that one may hold together better if you’re layering cake on top. Let us know how it goes! What if you don’t have an ice cream maker? Is there another kitchen tool such as a kitchen aid that you can use to churn the ice cream? I’m allergic to coconut, is there any alternative replacement for the coconut cream? HI – If I used a thicker consistency of almond milk combined with cashew milk in place of the coconut milk do you think this will work? Hi! I think that could work, but have not tried it myself. If you do, report back on how it goes! Thank for your recipe of ice cream. I tried a few main dish of yours and now it’s the ice cream turn. About the coconut milk it’s just once can right ? Thank you again for your yummy and wonderful recipes. I am not sure if anyone asked this, but can I use coconut flour ?? Hi! I have not tried that but if you do, let me know how it goes! Hi! You can use almond milk but I would, in that case, add an extra thickener, such as arrowroot starch to prevent ice crystals. Hope that helps! Good luck! Being on an ice cream blitz I have been going through and making your ice cream recipes. Can you tell me why so many have a cashew nut base? We find that the flavour of cashews seriously dominates the ice cream which is disappointing. No matter the added flavour (cherry pie or cookie dough) the base of cashew is just very strong and stops me from enjoying. We eat a lot of Little Baby’s dairy free ice cream and they also don’t use cashews as a base. Also as a tip when we chill the blended base in the freezer it actually churns too fast and doesn’t end up as smooth and creamy compared to letting it rest in the fridge before churning. Cashews are a great way to replicate a creamy texture! But, if you’re not into it, try it with another type of nut, such as macadamias or if you’d prefer to make this nut-free, just use two cans of coconut milk instead! Obviously, these alterations will affect the recipe but I think it will still turn out delicious! This ice cream is SO good! I used coconut cream, which made it even creamier. Hard to believe it is vegan. Make this if you are a chocolate and pb fan! This will absolutely be the first icecream I am gonna make with my icecreammaker! I got it from my parents but can’t find a good recipe, but this sounds AMAZING. I always loved the Ben & Jerry’s cookie dough and I eat vegan now, so a cookie dough icream to make myself sounds greaaaaat. The ice cream churning bowl has already been in de freezer for a week or two, but finally I can use it! YAY! Does anyone know a way around the ice cream maker part? Is there any other way to make this without one and still be dairy free???? We made this ice cream last week and it was gone in just a few days. I omitted the coconut oil in both the ice cream base and the cookie dough since we follow a WFPB lifestyle. I also substituted the all-purpose flour in the cookie dough for almond flour and it turned out great! I’m sure oat flour would work well too. The ice cream was so creamy and had great flavor! 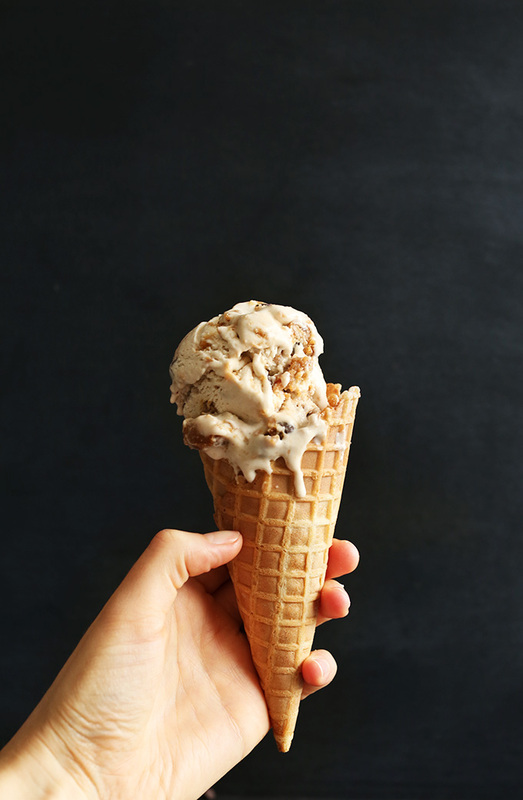 Most dairy-free ice creams use cashews OR coconut and whatever flavor is used is really prominent. I like that this recipe uses both cashews and coconut because of the flavor it gives the ice cream and the creaminess. We will definitely make this again! The only downside is that it takes a lot of time – soaking the cashews, chilling the ice cream base, putting in the ice cream maker, and freezing it before you’re able to actually eat it. This, I am about 99% sure, is going to satisfy my love for ice cream with chunks of good stuff in it. Blizzards at DQ were my jam until I realized that milk was making me fall over with pain and bloating, so THANK YOU for posting this! I’m super excited. So far I’ve made your dairy-free chocolate ice cream twice and been super happy about it! Also, good call on the cashews. I’ve seen a few vegan or raw recipes with this technique and they’ve been fantastic and uber creamy. My boyfriend has a tree nut allergy, do you think I could sub the cashews for a frozen banana or do you have any other suggestions? This is late, but we made this last night and subbed 1/2 cup plus 2 tablespoons peanut butter for the cashews. It was delicious! I think walnut would overwhelm the flavor in this recipe – sorry! Cashews really are best. I gotta get cashews immediately!!! Can I substitute almonds for cashews in the ice cream? No, unfortunately I haven’t found a way to make almonds a good base for frozen desserts. They don’t get as creamy! This was quite possibly the best ice cream I have ever made. Thanks for the perfect recipe! We went to Sage Vegan Bistro for dinner last night and tried their delicious KindKreme ice cream for the first time. We both agreed that it was really good, but that we liked your peanut butter cookie dough ice cream even better! She said fridge overnight not freezer; salvage by allowing to defrost on the bench for 15 mins, break into chunks and then blend/whip the cream in a food processor or thermomix u til soft serve. Pour into the freezer safe dish, add your cookie dough and fold in by hand. Freeze as normal. 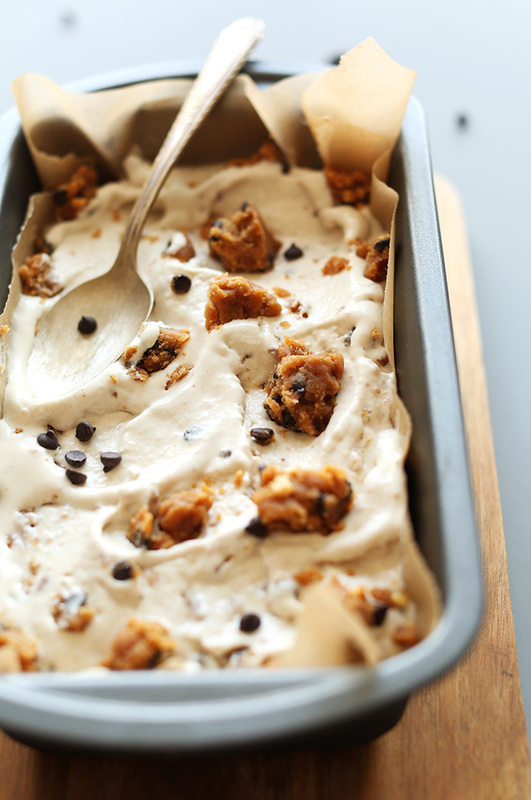 Since the nice weather is back, I have been craving for an indulgent ice-cream recipe, and this seems like heaven! I love the pictures and the very detailed explanation, thanks for this inspirational recipe!! Please excuse the dumb question…but to anyone who has made this…does it taste like coconut? 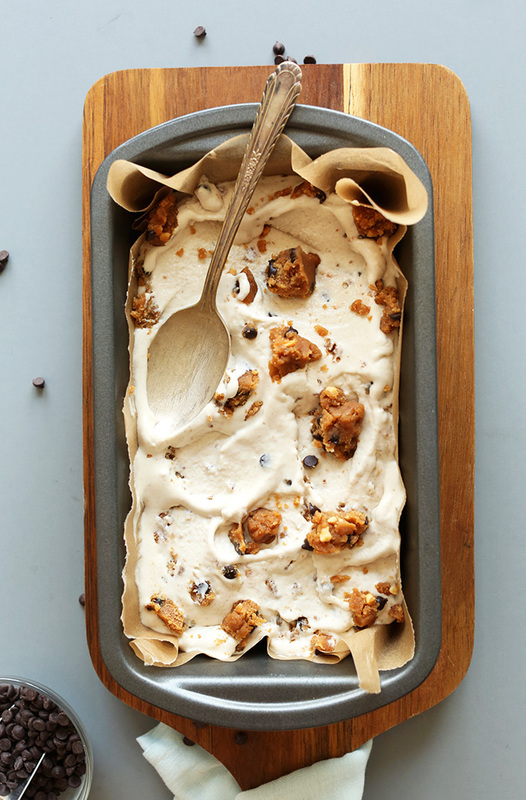 Thank you for this delectable vegan ice cream recipe! As a vegan, I really appreciate this! I see that you have lots of other vegan recipes as well. It was my first time making ice cream and it turned out perfect! As much as I love peanut butter, I enjoyed the coconut cashew vanilla ice cream soft served and just plain out of the ice cream maker without the cookie dough. Thanks again for your inspiration and compassion. I just made this and literally started eating it right out of the ice cream maker. My version has a bit more dog and cat hair than your recipe calls for, but, hey, its protein and everyone knows vegans don’t get enough protein ;) (just kidding, just kidding) So delicious, thank you for filling the huge gaping ice cream hole in my vegan life. This post is making my heart flutter and my mouth drool! Do you have a suggestion as to which ice cream maker to buy? I think I need to invest and create delish treats for myself and blog viewers! 1 14-ounce = how many gramms? I’m totally missing the Rhonda jokes, but made this for my lactose free boyfriend and my vegan self and it was fantastic! Peanut butter and chocolate our favorite things!!! We’re studying abroad in Prague and the only non dairy ice cream is sorbet and we’re missing the creamy stuff. Thanks for providing this option!! This looks really good, well, except for the peanut butter part. I am one of those odd people who do not like peanut butter. Cookie dough ice cream is all the bomb, but not the PB part. How could I make the cookie dough without using a nut butter (not a fan of sunbutter, peanut butter, almond butter, etc)? Thank you! OK MAMA! I totally boofed this one up. Can you tell me what I did wrong? Anyway, I put in about 1/2 cup of smooth peanutbutter in addition to all of the other ingredients, and figured since I added a solid, I should add extra liquid. I added about 1/4 of almond milk. Followed instructions perfectly, but in the final churning stage it started to look really grainy instead of creamy. I stopped the churning at about 30 minutes, and scooped the ice cream out of the ice cream maker. SUPER THICK. Like, crazy thick. Placed it in a container to go back in the freezer, and we’re enjoying the finished product right now. And it’s AMAZING. And delicious. My partner loved it. However, I still think I messed it up. The texture is definitely more granulated and sticky, and less creamy. Like little balls of delicious heaven, and less smooth and refined. Thanks for all the help, you’re awesome! Hmm, not sure! I think the peanut butter might have something to do with it because it definitely thickens it. I would’ve added more liquid next time. Hope that helps! Glad you enjoyed it anyway! This is late, but we made this last night and subbed 1/2 cup plus 2 tablespoons peanut butter for the cashews. Subbing for cashews vs in addition to cashews may be the best way to go. Thanks for sharing your subs! 2nd time I’m making this in a month and we love it! Actually I’m wondering why we need to churn the cream? My boyfriend is so impatient that he eats it before I even have time to churn it. Does anyone know if that step is necessary? haha, your boyfriend is my kind of ice cream lover! Glad you enjoyed this recipe. Thanks for sharing! 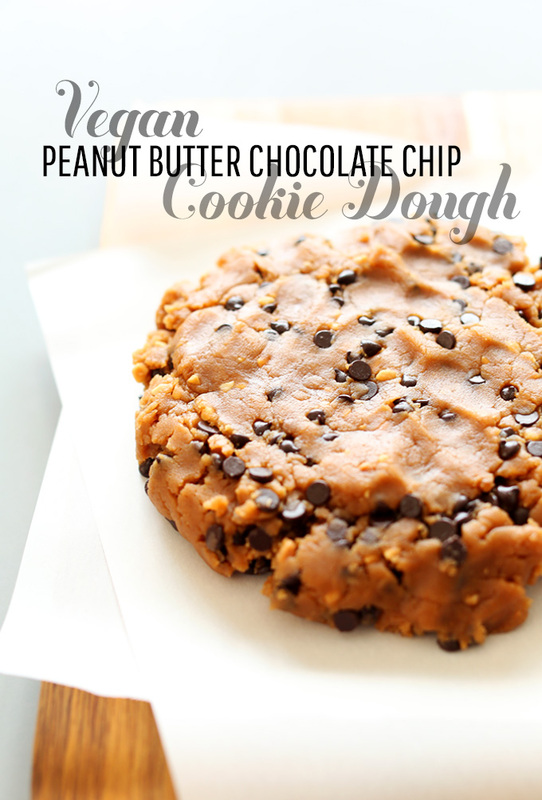 Is it possible to make the cookie dough without the peanut butter? I have been wanting to make vegan cookie dough for awhile but I don’t care for peanut butter and I think it is crucial in this recipe. Any help is greatly appreciated! You totally can! Just compensate with more butter and/or less flour. Hope that helps! Is there a specific brand of coconut milk you always use? I’ve tried making coconut whipped cream with a couple brands and haven’t had much luck. I had heard that there were specific brands that are good for whipped cream, and I wasn’t sure if the same thing applied to ice cream. Thanks! And I love love love your blog! Do I have to add all of the coconut milk or only the creamy part? You can do either! The cream only will make it creamier. The milk AND cream makes it slightly less creamy. Up to you! Discovered your blog searching for vegan peanut butter ice cream. WOW! Impressive. And this ice cream is so delicious. Served it to guests who loved it. So flavorful. Creamy. Just deeply satisfying. Twenty minutes of taking it out of the freezer didn’t begin to soften it. We finally had to (are you sitting down for this?) microwave it a little. Thanks for sharing your talents with us. Since no place here serves vegan ice cream, have to make it myself and can do it better/more healthfully/less expensively than any commercial place, thanks to tou. So glad you enjoyed the recipe, Ellen! It’s fine to microwave it a little. That’s what I do in a pinch! Does it go hard and ice crystally after the leftovers have been popped back into the freezer? All of the vegan icecreams I’ve made have done that, despite following the recipes to the letter. So great to hear! Hope you enjoy every last bite, Cheri. Thanks for sharing! Oh my…I need an ice cream maker. BAD!!! Oh I would make this today. So…maybe it’s GOOD I don’t have an ice cream maker because I bet I’d eat the entire thing today. Seriously. It’s one of those days. I can feel it and it’s not even 8 am. Think I’m going to have to have peanut butter in my porridge this a.m. after looking at this delicious recipe!!! yes. EVERYTHING ABOUT THIS IS A YES. Absolutely LOVE LOVE this recipe!!! Really want to try it but I don’t make ice cream much so I don’t see the point in investing in an ice cream maker. Could I go about making this ice cream without one? Would it take away from the consistency/ texture? And what process could I use to make this by hand? It will no doubt affect the texture, but it will still be delicious. Just add the batter to a freezer-safe container and vigorously whisk every hour for 6 or so hours until soft serve-like. Kind of a pain but the only other way to incorporate air and make it fluffy. Then add in your cookie dough near the end. Good luck!! I made this today and it was amazing! It’s not going to last long in my house! :) Thank you for the perfect summer recipe!! Oh please stop with this goodness. I love vegan recipes like this. My mouth won’t stop watering! I am neither vegan or dairy free, but this looks AMAZING! 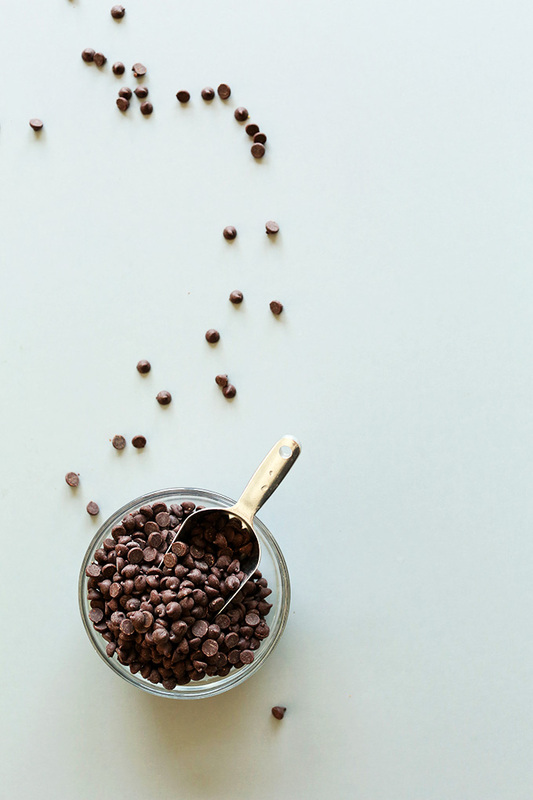 My only substitution will be carob chips for the chocolate. I’m in love! Completely smitten. I made my first batch of peanut butter cookie dough for cupcakes and it completely surpasses plain cookie dough. Luckily I have all these ingredients on hand! This is chilling in my freezer right now. This stunning recipe popped up on my Pintrest feed and I HAD to make it! Right away. My machine struggled to cope with the thickness of this part way through the first churning, and actually popped its top off… oh well, stirred the rest of the cookie dough in by hand. Can’t wait to try it :) Thank you Dana! you just love photographing your food! and i love looking at it! you do such a great job. i did, however, purchase your photography course and learned a great deal from it. keep doing what you are doing. hey. is there a way to make this without an ice cream maker? there must be! You can, but it won’t be as creamy. Just pour the batter into a freezer safe container and whip with a spoon every couple hours to aerate. Hope that helps! Amazing! and peanut butter cookie dough, you’re a girl after my own heart! 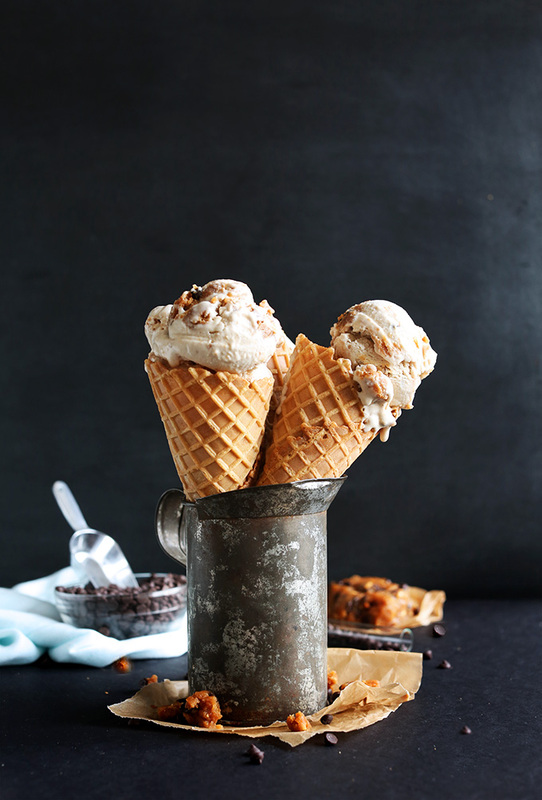 loved this recipe planning to make the ice cream with my friend tonight…. Is there an ice cream maker that you recommend? I’d love to get one, but I don’t know which ones work well with vegan recipes, or if there is a difference. What about a smaller ice cream maker? I dont want to end up with a quart lol. That looks so good. I’m angry I’m not eating it right now. Yum! 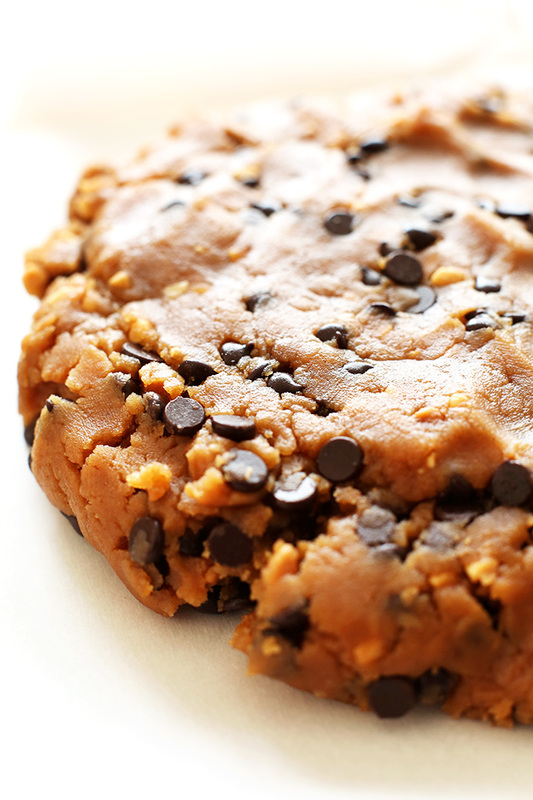 A quick question about the cookie dough…can I just bake them up from this recipe? Because they sound like something worth trying on their own too! I don’t know! I think they would work but I didn’t try! I would add a flax egg before blending the butter and sugars together. This looks so delicious and easy! I haven’t tried coconut milk in vegan ice cream, only almond milk, so I’m looking forward to giving this a go! And of course, the PB cookie dough. What a fantastic combo! Thank you, Dana! Can we sub almond butter and had some sea salt ourselves. 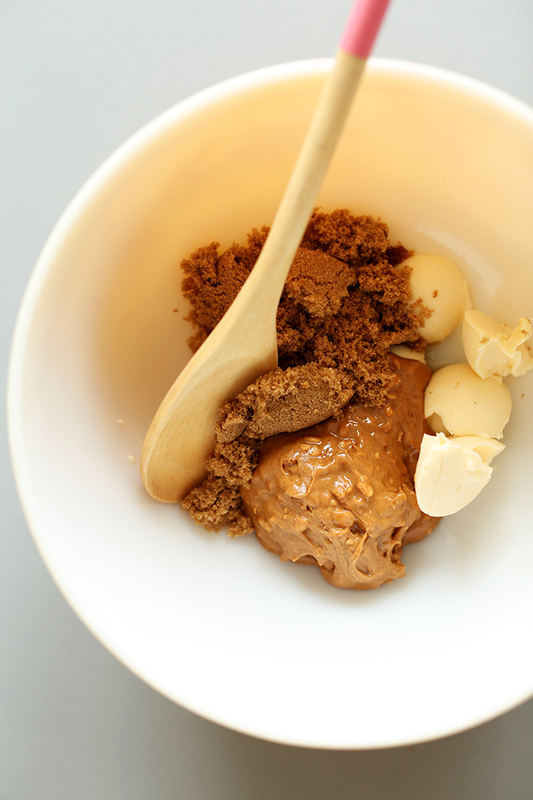 Also may we substitute coconut sugar in the ice cream and cookie dough? Btw this recipe looks amazing. I think coconut sugar would be fine! And yes, almond butter would be delish. Good luck! I really want to eat this now, it looks absolutely amazing! Wow, this looks good! And you’re right0 all ingredients I have in my house :) Cant wait to try this! This confirms something I’ve suspected for a while: I NEED an ice-cream makerD: Cookie dough ice-cream used to be one of my absolute favourites. I can’t seem to stop staring at the photos in this post…. hot damnnnn. i dont have an ice cream maker but that cookie dough is totally happening asap. drooling at work…this is awkward. Oh my gosh. I don’t think I have any words this time. HOW DID YOU KNOW COOKIE DOUGH ICE CREAM IS MY FAVORITE? I’m going to love this dairy-free version. I can just tell. It looks phenomenal!! I think I need to invest in an icecream maker purely for this recipe alone. It looks so good, I can’t believe something so tasty is dairy free and vegan! This is look delish !!! Definitely will try to make this recipe this weekend…. Who care about the winter time in Sydney!!! Ice cream is good for winter !!! ice cream year round for the win! I love your recipes and I’ve already made some. All delicious!! I’m craving for trying any of the ice-creams you’ve posted but where I live it’s difficult to find cashews. Is it possible to use another nut instead of them? Thanks a lot. Depends on what other nuts you have access to. Macadamias would be the next best substitute. Otherwise, just forgo nuts and use TWO cans of full fat coconut milk instead of one. It’s not a perfect substitution, but will yield yummy results! hope that helps! Nope! It won’t be AS creamy, but still good! Great question. I would, in that case, however, be sure to add an extra thickener, such as arrowroot starch to prevent ice crystals. Hope that helps! Good luck. I am eagerly awaiting the holidays this year, as I will FINALLY have something expensive and immeasurably hoped for upon my wishlist- a NiceCream maker, baby!! Happy Animal Friendly Indulging ya’ll! But you know… If you make it with coconut and no one else likes it, then you’d have to eat it all yourself, which would be too bad.. This is absolutely gorgeous. Definitely on my to do list! Wow. This looks so tasty. I seriously want to lick up that little dribble of ice cream dripping down the cone. ;) I have ice cream envy! So perfect! A healthier take on ice cream. 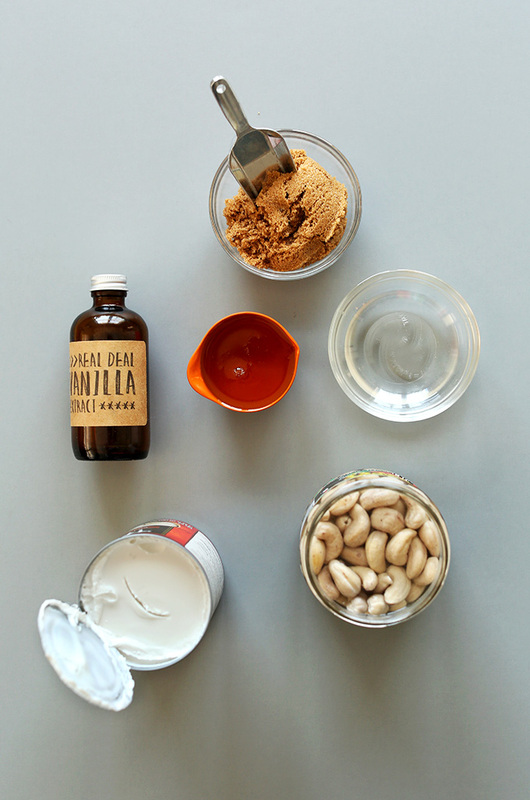 The coconut milk is my favorite part here – pinned! abandon the extra bags of frozen bread you have in the freezer! An ice cream maker is so worth it, especially if you’re dairy-free and have to make a lot of it yourself!! Hi Sarah! It will no doubt affect the texture, but it will still be delicious. Just add the batter to a freezer-safe container and vigorously whisk every hour for 6 or so hours until soft serve-like. Kind of a pain but the only other way to incorporate air and make it fluffy. Then add in your cookie dough near the end. Good luck!